“Near this were two or three fragments of pottery, and close under these a small urn was discovered, which had been crushed by the subsidence of the cairn stones… The bottom of the urn was resting on the * calm,” and lying amongst the sherds was a flint knife in such a manner as to suggest that it might have been placed in the urn. The sherds still had adhering to them some light brown soil, which gave traces of phosphoric acid. This appears to be “calm” with a similar composition to the substance found in the urn discovered in the kist on Western Down. It contained a little peaty matter. The urn from its size and shape corresponds with those known as food vases, and the presence of phosphoric acid in the fine soil which was therin may indicate the remains of food… The dimensions of the vase are as follows: Extreme height, 7½ inches; diameter of bottom, 3 inches; at mouth (internal), 5 inches; thickness at rim, one eighth of an inch.”, TDA, 1898, pp 109 – 110. * Presumably the word “calm” refers to undisturbed ground. 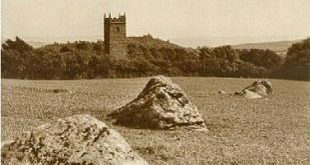 The above is an extract from a report submitted by the Dartmoor Exploration Committee in 1898 and it describes their ‘investigations’ into a burial mound at Fernworthy. As can be seen they discovered an “urn” which was later described as a “food vase” that in their opinion may have contained food at some point in the dim and distant past. This serves as a good example of the various burial sites at which such remains were discovered across the vast expanse of Dartmoor. Considering that these investigations were undertaken some hundred odd years ago they did not do so bad in recognising the importance of such grave goods. Such styles of ceramics are by no means confined to Dartmoor and can be found throughout much of the UK and Europe and it is from the latter that their origins lay. It is widely accepted that the first evidence of this style of pottery was discovered in the Tagus estuary of Portugal and a suggested date of between 2800 – 2700BC has been given. The people who manufactured these pots/vases/urns became known (in some quarters) as the ‘Beaker Folk‘ for obvious reasons. The typical beaker could be described as: “open mouthed, narrow-necked vessels in a ‘S’ shaped profile. They are covered with intricate, if not fastidious, decoration of impressed cord and incised lines in bands down the sides.”, Parker Pearson, 2005, p.74. At one time the appearance of this style of pottery was thought to suggest that there was a mass invasion by the Beaker Folk who brought their skills and ideas with them. This tide of immigration was then considered to, by means fair or foul, have replaced the indigenous population of the UK. This idea has now virtually been de-bunked and as Newman suggests: “This concept has now been largely rejected and archaeologists today are inclined to view the change as cultural diffusion or a migration of ideas and styles linked to small-scale movement of people.”, 2011, p.65. In other words, migrant settlers and/or traders came to the shores of Great Britain with the knowledge of beaker production which then trended with local communities. This was akin to the introduction of a revolutionary new smart phone today, suddenly it’s cool to have one and this leads to a clamour to own such a prestige item. Slowly, as other people see them, their occurrence spreads across the country. Some may have been purchased, some given as gifts, others maybe stolen or even trade-exchanged. Personally speaking I find the study of pottery a complete yawn but in the field of archaeology such artefacts play a major importance in many respects. Beakers are an excellent example of this because along with the actual ceramics came what some describe as the ‘Beaker Package’. Not only did the ‘Beaker Folk’ have a unique and new style of ceramics they also had very different cultural beliefs and technologies which included metal working. More specifically this ‘package’ of concepts contained copper, bronze and gold smithing, new types of ‘barbed and tanged’ flint arrowheads, novel jewellery forms, and very different burial rites to name but a few. There is also fairly recent evidence to suggest that one more item came with the package – alcohol. An excavation at Ashgrove near Fife, Scotland, turned up an organic layer lying in a grave, later pollen analysis of this revealed large amounts of lime pollen which was not commonly found in this area. On closer examination it was suggested that the pollen had originated from the liquid contents of a beaker which in turn could have been an alcoholic drink, Parker Pearson, 2005, p.78. If this is the case and if the size of the Fernworthy beaker is anything to go by these beakers would have held a decent amount of brew which would put our pint glasses to shame. It is also interesting to see that at Amesbury a ‘replica’ of a beaker period bronze dagger that was fashioned from flint and it dated to around 2000BC, Pryor, 2003, p.265. Could this suggest that someone wanted the latest fashion but did not have the knowhow to make such an item or the necessary means to trade for one and so it was reproduced in flint? So, as noted above the first signature (so far) of the beaker culture appearing in the archaeological record was between 2800 – 2700 BC. It is widely suggested that the first beaker signature appeared in the British Isles around 2500BC which means that it took roughly one hundred years to reach our shores. It must be remembered that on it’s arrival the indigenous population did not simply adopt these new technologies and beliefs overnight. It was a gradual process that due to contact distances, maybe even reluctance took time. Now let’s drill down to a more specific and relevant (to this website) area, that of Dartmoor, what would possibly have happened? Firstly there was a local population of various communities who were using flint tools and weapons and also burying their dead in communal chambered tombs. One day a group of immigrants, perhaps itinerant craftsmen or maybe traders travelled from Europe or other areas of the British Isles and appeared on Dartmoor. With them they had the ‘Beaker Package’ of skills which took the fancy of the locals. Now whether these immigrants/traders/craftsmen settled on the moor or temporarily stayed for a period we know not. However, what we can be sure of is that their ideas, skills and beliefs were slowly adopted and today show up as a signature in Dartmoor’s archaeological record. Whereas before the only use of pottery was for domestic purposes there was a gradual shift to additionally using ceramics as grave goods the the form of beakers. Similarly there is a marked change from communal burials to single internments (in crouched positions) that were placed in kists or pits which lay under round barrows or cairns. Barb and tang arrowheads made from jet, amber or flint became in common usage along with various items made from gold and copper alloys such as bronze, Newman, p.56. The shift from communal burials to single inhumations also hints at a change of beliefs, no longer were the ancestors revered as icons of worship and protection. Instead the emphasis was on some other form of deity and burials were concerned with ‘the man’ so to speak. Along with this there was a clear indication that there was some idea of the after-life and the need to take people’s prized possessions on that journey for later use. This can be clearly demonstrated by the grave goods that are found today. Take for example the above finds in the Fernworthy burial mound, along with the beaker a small piece of bronze along with a wooden handle (suggestive of a knife or spear head), a ‘V’ shaped perforated conical button made from Kimmeridge shale and a flint knife, Butler, 1991, p.165. These grave goods suggest several things; firstly that the beaker culture had been adopted by the time of this burial, secondly this community had trading links as the button originated from Kimmeridge in Dorset. Whether by local manufacture or trade, bronze implements were available but also the old style flint knives were still held in some regard. It has also been suggested that along with the well-accepted phenomenon of alcohol came the need to take ones drinking beaker into the afterlife where a ‘swift half’ could still be enjoyed. Like every social trend the ‘Beaker Package’ appeared to peter out around 1800BC when alternative life styles, beliefs and practices replaced it. As can be seen from the illustration below, all chronological transitions were slowly phased in and then gradually phased out with in some cases quite a period of overlap. Nothing was immediate which reflects the slow communicational spread of ideas or people. Certainly people were talking to each other or else change would not have occurred. So, it could be said that the arrival of the ‘Beaker Package’ heralded a brand new era for Dartmoor as it did the rest of the British Isles. Their distinctive pots have given us an excellent dating guide when they are found along with all the associated clues and insights of life during the late Neolithic and Early Bronze Age periods. We shall never know how these ideas arrived or who brought them, likewise nobody can ever imagine the wow factor they produced amongst the local communities. Butler, J. 1991. Dartmoor Atlas of Antiquities – Vol. 2. Exeter: Devon Books. Dartmoor Exploration Committee. 1898. Fifth Report. Transactions of the Devonshire Association – Vol. – 30. Newman, P. 2011. The Field Archaeology of Dartmoor. Swindon: English Heritage. Parker Pearson, M. 2005. Bronze Age Britain. London: Batsford Ltd.
Pryor, F. 2003. Britain BC. London: Harper Collins.